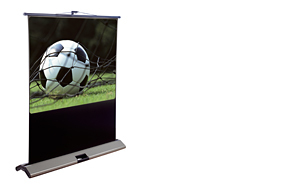 The Oxygon Movielux is another excellent alternative of portable projection screen, suitable for presentations and events. Instead of a tripod the Oxygon Movielux is equipped with a steady light grey steel case from which the screen is raised and set to required height with an adjustable pole, which is stored in an integrated pole storage area when not in use. With the Oxygon Movielux you get great stability, yet light weight which makes it easy to carry in the useful carry handle. The screen fabric is matte white with a gain of 1.0 and black borders which improve the perceived contrast. Perfect for presentations and events. Practical carrying handle integrated in case.